It will also help to have a good lighting "face shot" of your subject for the coin. If you don't have one, maybe now would be a good time to find or take a digital picture. Step 1: We need to clear out the content of the original coin to make room for our own image. To do this, we'll improvise just a little bit: set up a selection on the inside of the coin, and then select Filters - Gaussian Blur at 90 px. Set it even higher or lower to suit yourself. Leave the selection for the next steps. 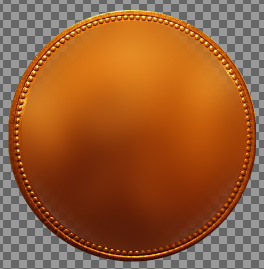 If the high 90px Gaussian blur fades any part of the coin, use the Clone tool to fill it back in. Add the first transparent layer, then (keeping the internal area of the coin selected) fill it with wobbles, change the layer mode to overlay, and lower the opacity to about 40. Add the second transparent layer, (keeping it selected) fill it with granite1.jpg pattern, change the layer mode to overlay, and lower the opacity to about 25. It's time to work on your face picture to add to the coin. I'm using one of myself, that you might recognize from previous posts. 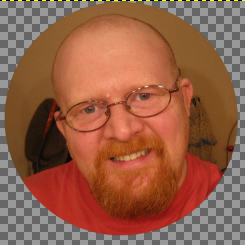 Cut your face image out using the Ellipse tool, similar to what's shown above. Then copy and paste your image as a new layer on the coin image. 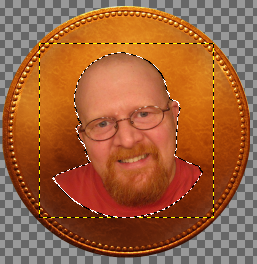 I need to remove the background area from my face image, so I'll be using the Lasso Select tool to create a selection. 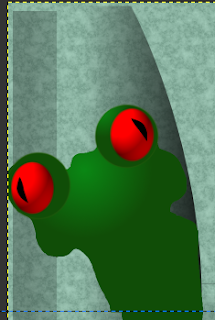 Invert your selection then press delete to remove the background from your face image. Once you create the selection, save it as a path for later. 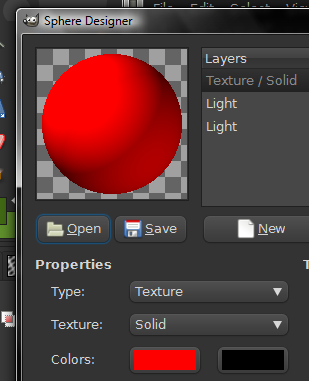 Remove the selection from your face image layer. 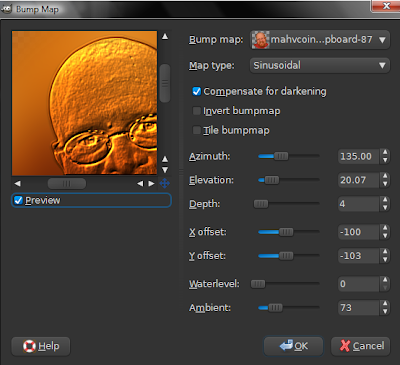 For the bump map, you are selecting the trimmed face image layer. If you managed to save a path of the face image selection, now would be a good time to run a 2px dark brown stroke on the coin layer. 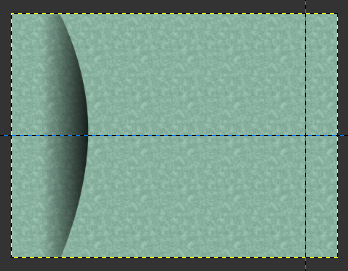 Using the Path tool, create a circular path to fill outside the face image on a new transparent layer. Do not close the path. 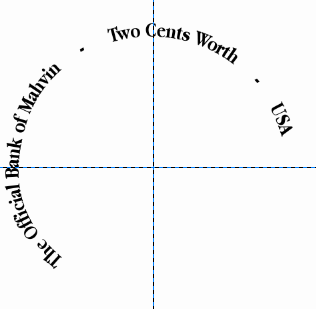 Using text of your choice, and wording of your choice, select the Text tool to create wording for the circular path. You may have to use trial and error and CTRL + Z to undo Text Along A Path that doesn't fit properly. Once you get the text to fit the Path to your satisfaction, click off the Text Layer, reselect the last transparent layer we made just previously, fill the background with white. Jump to the Paths dialog and select the new text path, use path to selection. 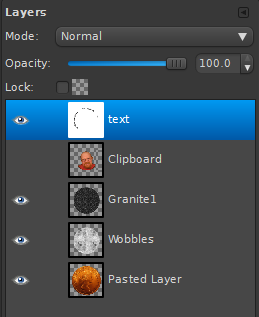 On the layer dialog, fill the selected text with black. 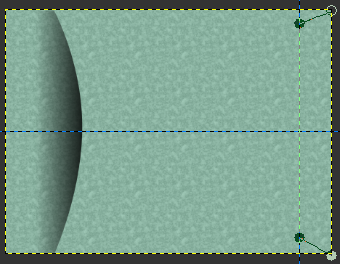 Remove the selection from the text layer. 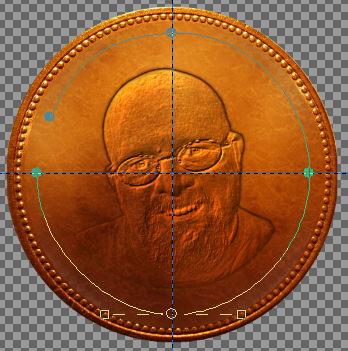 Highlight the coin layer, go to Filters - Map - Bump Map, and select the text layer for the bump map. 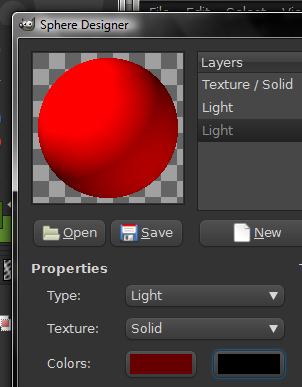 Use the same settings from the face image. 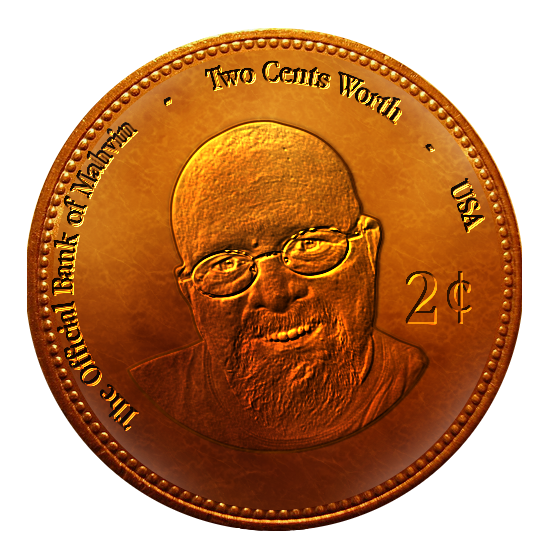 Time to add the 2¢, with a little help from charmap.exe (you can open the character map by going to your Windows start button and typing charmap in the run box - hit enter). 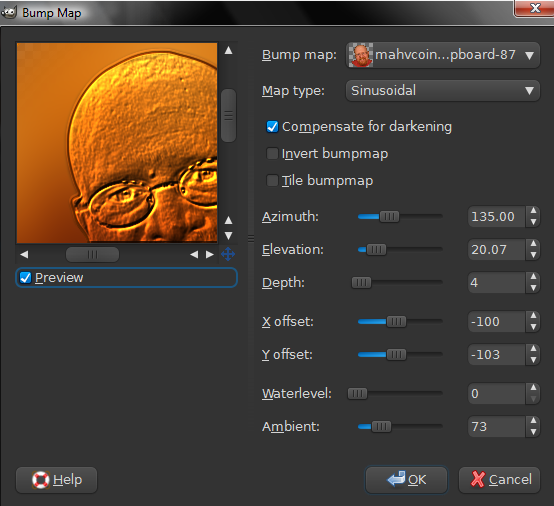 Once you get charmap open, select the cent sign and then copy. 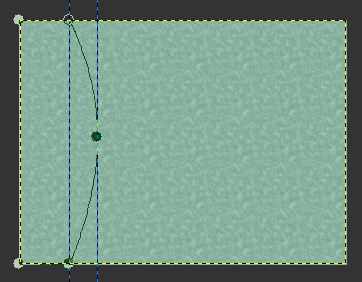 When you use the Text tool and type 2, just CTRL + V the clipboard contents (¢) into the editor. 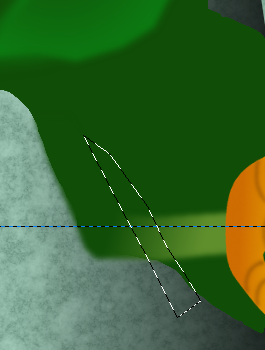 Make sure the text layer (with the circular path text on it) is visible, merge the new 2¢ layer down. Use the Airbrush tool and color white, to cover over the previous "circular" text, to keep the upcoming bump map from darkening the circular text even more on the coin layer. 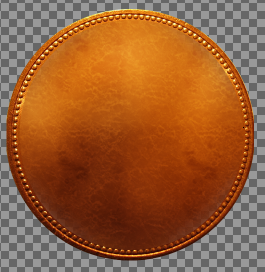 Once again with the coin layer highlighted, go to Filters - Map - Bump Map, reselect the text layer as the bump map, use the same settings as both times before. 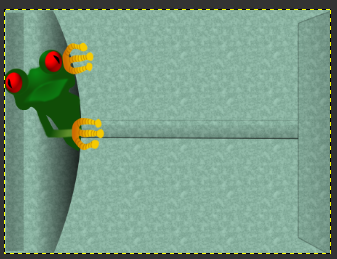 In Part 1 we made an envelope graphic to substitute as an postcard invitation. 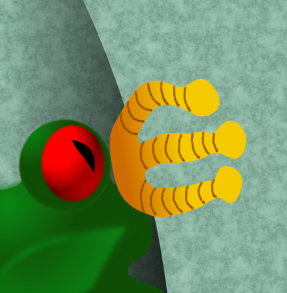 In Part 2, we'll pick up where we left off, and add the tree frog image. If you haven't done Part 1, you can get started with that here. Open treefrog.xcf from part 1. 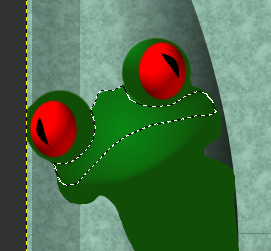 Create a new transparent layer, name it frogbody. 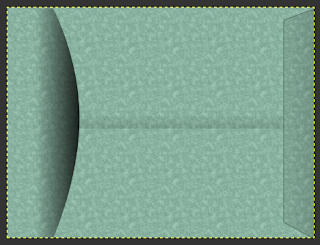 Fill the selection using the Blend tool, choose a dark green (104d07) foreground and lighter green (0a8714) background, shape set to Radial with NO offset. Run the gradient path from between the eyes downward past the face. 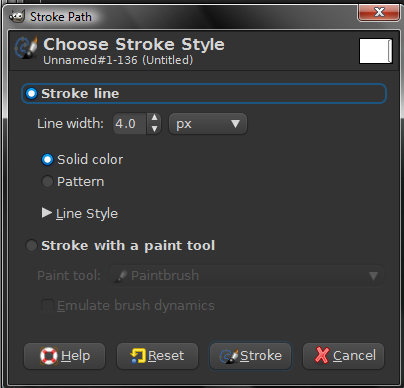 Then go to Selection on the menu and choose "To Path" to save it as a path for later use. 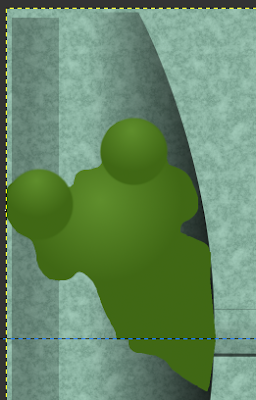 Keep in mind it might take a couple of attempts to get the body outline to where you want it. 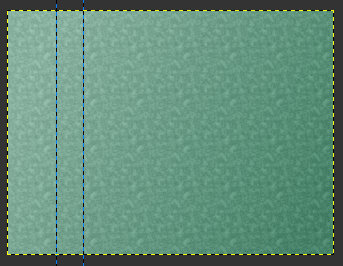 Deselect the selection after filling it with a gradient. 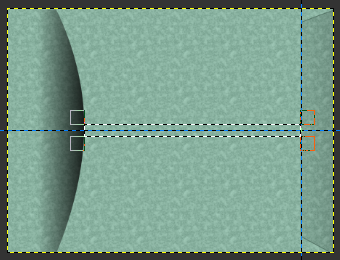 Choose Selection From Path, fill the pupil with black using the Bucket tool. While still selected, copy the pupil and paste it to the other eye. 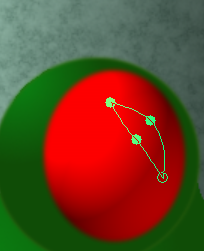 While the pasted selection is still a floating selection, you can flip the pupil horizontally and rotate it before you anchor the selection. When done, deselect the selection. 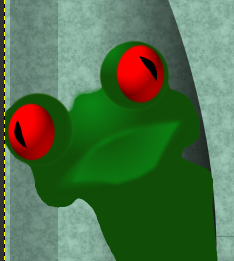 Apply the Blend tool, using the same green colors as before for your gradient, making your gradient path from the center of the selection area, diagonally (the same direction as the frog's lean) about halfway past the selection area. 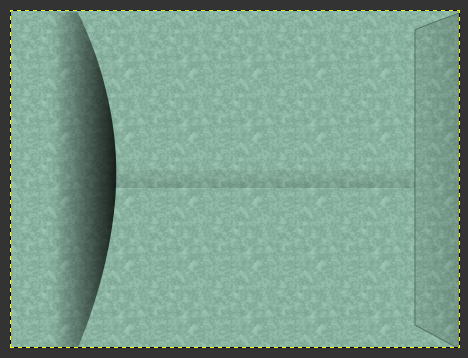 Once you have the result, apply a Gaussian blur of 10. 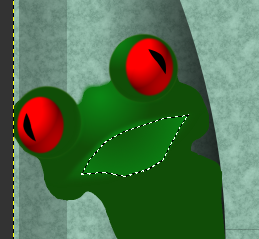 You want to apply the gradient in the direction where the lighter green is toward the bottom of his jaw, and darker toward his lips. 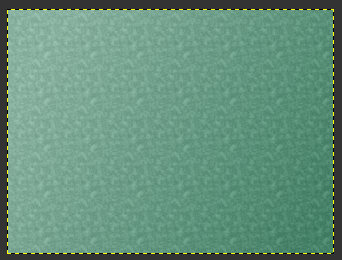 Once you get the result you want, apply a Gaussian blur of 10. 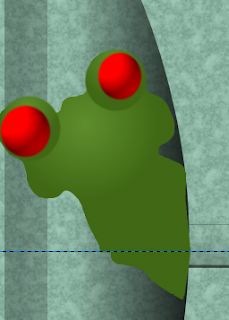 It's time for the feet/hands, create a new transparent layer, name it hands. 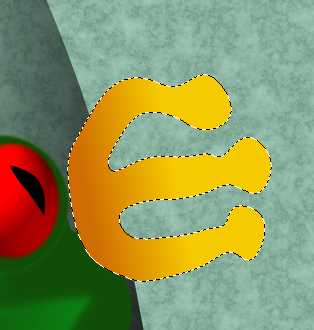 Basically, long fingers with bulbous fingertips. 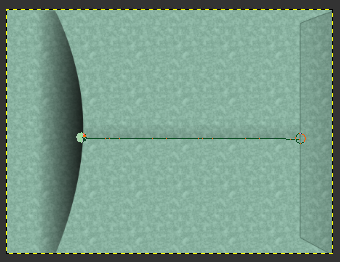 Because we need to apply gradients to each hand, we need to create each hand individually. 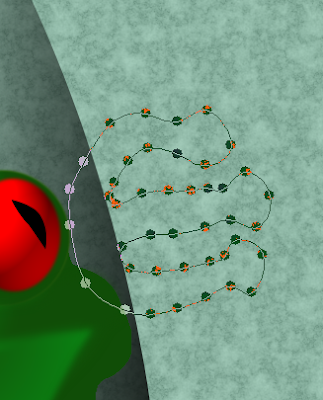 You can even make one hand and then copy/paste it for the second one. Choose Selection From Path, fill the selection with a dark orange (cf6c02) color, and a lighter yellow-orange (f6cb01) color. Apply the gradient in the direction where the fingertips are lighter in color than the hand. 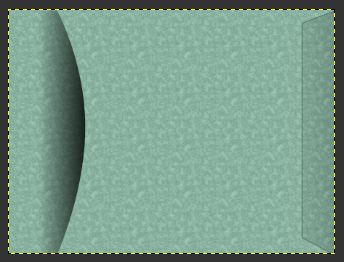 Apply a Gaussian blur of 6. Merge the fingers layer down, selecting the hand layer, then Edit - Copy. 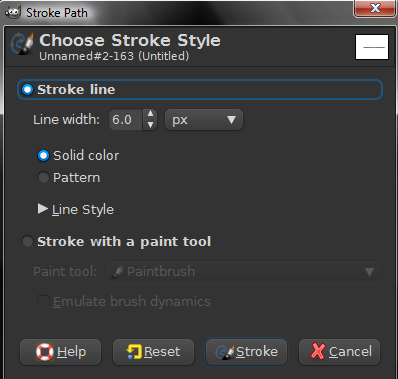 Then select Edit - Paste As - New Layer. 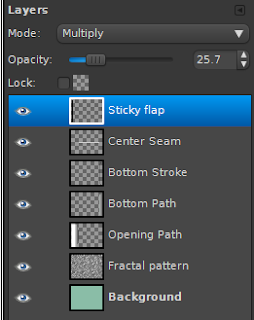 Flip the clipboard layer, vertically. Deselect the selection. 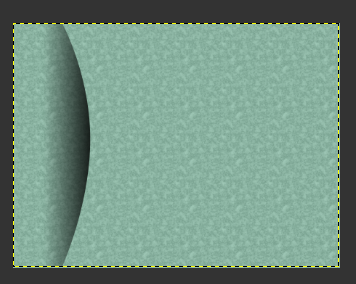 Apply a Gaussian blur of 8. If you feel like the hands are too big or in the wrong direction, don't fret, simply select that layer and scale the layer smaller, or rotate them until you are satisfied with the direction. Press delete to remove the area in the selection. We're done! 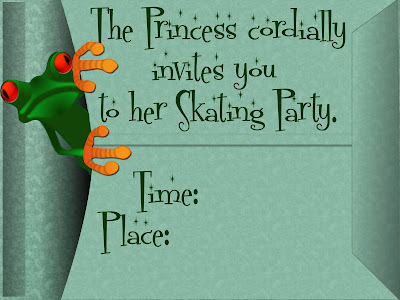 Add your own font and decorations to complete. 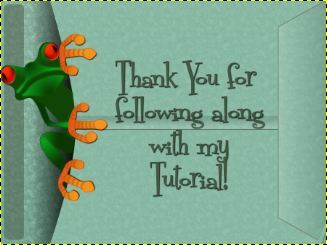 This tutorial looks longer than it really is, due to the numerous screenshots being shown to illustrate the process. Open a new drawing with white background, 6" x 4.5" (standard postcard size) at 300 dpi. 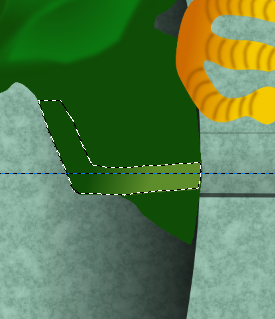 Fill the lower layer with any color of your choice. 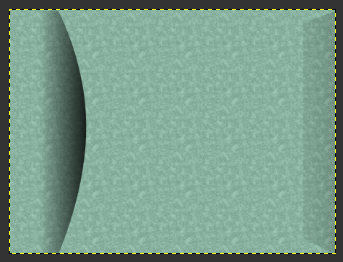 I'm using an off blue-green mixed with gray (8abda7). 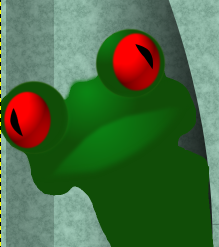 On the top-most layer, use any pattern of your choice ( I am using "fractal pattern"), in normal mode, and lower the opacity to 20 to give it a proper blend. 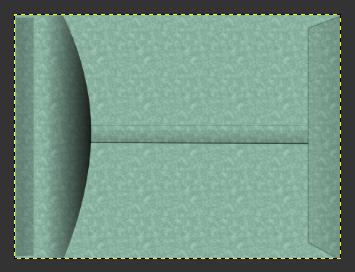 Now to complete the envelope, we need to make the horizontal seam that runs across the center of the envelope. 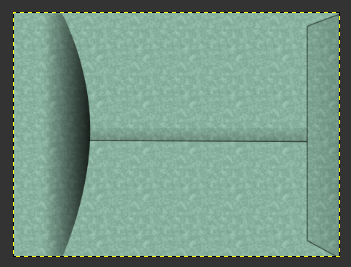 Turn your horizontal guide at center point (675 px) back on or reset the guide. 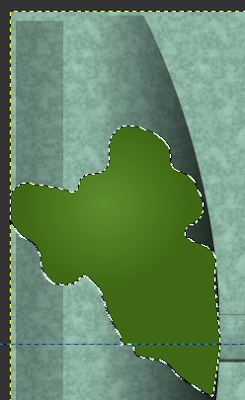 If you want to add the "sticky area on the top flap (left), use the Rectangle Select tool to create the thin strip area, (on a new layer) fill it with a darker color (527264) and lower the opacity to about 25. Save the file as treefrog.xcf so that it can be used with layers again for part 2 of this tutorial. 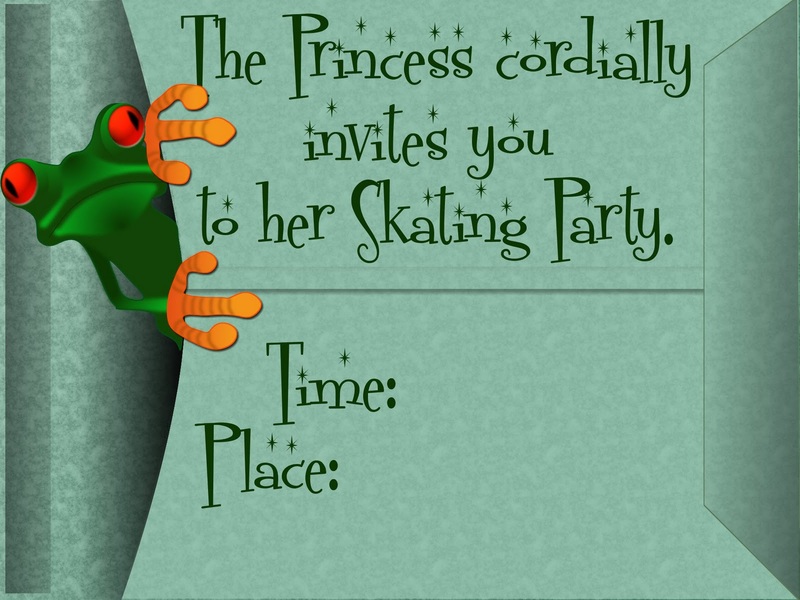 That's it, we're done with this portion of the invitation!